R Madhavan cannot stop smiling after scoring a huge hit in 3 Idiots, co-starring Aamir Khan, Kareena Kapoor and Sharman Joshi. The actor's performance has been much appreciated, and Bollywood seems to have opened its doors even wider to him. He tells Syed Firdaus Ashraf how his life has changed after the film's release. How is life after the success of 3 Idiots? I think we moved from happiness to supreme happiness to ecstasy. Now, we're numb. I don't know how to react any more because the film has broken Sholay's record. It has touched people the way we expected it to. I have seldom met someone, who has not seen the film more than once. So obviously, the film has stuck a chord somewhere. I think (director) Raju Hirani is the true superstar of the film. But how has your life changed after its release? Let us put this way: I cannot eat paani puri on the road. But I'm not complaining. People have come and told me that they could open up and speak to their fathers in real life just like my character, Farhan Qureshi did in 3 Idiots. Would you say 3 Idiots has changed your life completely? As a performer, I don't feel that way because anyone could have done my role in 3 Idiots. It was tough for me because it took a lot of effort to play a student. Secondly, it was not a populist role; it was more of narrative role. I had to be an observer and admirer of Aamir. Few people noticed that I used three voices in the film -- one was the past, one was as a student, and one was the present. That was challenging. But I feel my best is yet to come. Which has been your most satisfying role so far? I think it was my role in Ramji Londonwale. In retrospective, people say it was a good film. You were the narrator of the film, and enjoyed more screen space than even Aamir Khan. That is the greatness of Aamir Khan. He is 44 years old, and took up the challenge of playing a student's role. He looks very young in the film. All of us did our jobs and you can see the respect and love we have for each other in the film. There was no insecurity. Did you feel sad about 3 Idiots controversy? Not sad. But I feel Chetan Bhagat wanted some publicity for his book and he got it. Anybody, who has seen the film, will notice it. Now he has apologised so I don't think there's any controversy now. You studied engineering and then shifted to acting, like your character in 3 Idiots, who shifted to photography after engineering. Did that bother your parents? I got a Bachelors degree in Electronics and a Masters in Advertising. I had wanted to become an engineer but by the time I turned 19, I didn't want that anymore. I felt working from 9 to 5 was not my kind of life. When did you want to become an actor? I never thought I was a good actor until the media started writing about my acting skills. I used to act only for the sake of money. I was teaching public speaking in Mumbai when I got a call to work in the television serials, Tol Mol Ke Bol, Banegi Apni Baat and A New Love Story. Banegi Apni Baat became a huge hit and my parents called me to ask what I was doing in life. When I said I wanted to act, they were confused. After that, I started taking my acting career seriously. 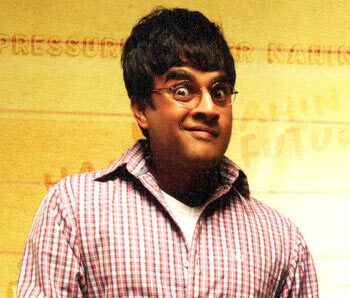 What do you feel about the education system now after doing 3 Idiots? I think it has to be revamped in a big way. The education system came to India after the Industrial revolution. People used to think then that they should study in order to be fit for a job in the industries. So Mathematics, Physics and Chemistry were essential subjects. All over the world, Mathematics has been given the most important position because it was the key to survival. If you didn't score well in these subjects, you would be considered a failure. That is still ingrained in our parents' mind and they feel that if my child has to succeed, he has to be good in Maths and Science. I feel a child must have the right to choose. But in the golden era of Indian history -- during the time of the Nalanda University -- this was not the case. Architecture, arts, philosophy, life sciences and textiles were important. Tell us about your new film Teen Patti with Amitabh Bachchan and Ben Kingsley. From a student, I'm playing a professor's role in that. Teen Patti is a hard-core commercial film. It is about greed and lust, and how youngsters want everything quickly. How was the experience of working with Ben Kingsley? I've always been a huge fan. I saw Gandhi when I was a kid. Ben Kingsley played that role brilliantly. I remember the scene in which Mahatma Gandhi was thrown out of the train. That scene was brilliant. I never expected to do a film with him. He makes you feel like a newcomer. What is your wife's reaction to your growing female fan following? Luckily, Sarita and I grew up in the industry together so she feels amused and happy. Sometimes, she feels sorry for the girls. She is a huge fan of Shah Rukh Khan (laughs). Your son Vedant is four years old. Yes, he is half-Maharashtrian and half-Tamilian. My wife is a Maharashtiran (smiles). But I can speak Marathi very well. I was born and brought up in Jamshedpur, in Jharkhand. My son can speak Marathi very well but cannot speak Tamil. I am doing a film called Tannu Weds Mannu, starring Kangna Ranaut. It is directed by Anand Rai. Do you think success in the Hindi film industry came late to you? Honestly, I did films that I always believed in. I have had limited Hindi releases so far. After this film, I don't know whether Yash Raj will give me a solo lead film. Maybe that is the yardstick for a Hindi film hero to get accepted but I am getting endorsements on a national level. That means I have been accepted nationally. 3 Idiots: Hit of the decade?